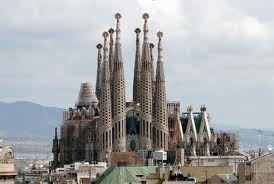 Last night Tony and I watched a 60 Minute programme on La Sagrada Familia - an enormous Catholic Basilica that has been under construction n Barcelona for over 100 years and is not yet finished. The programme interviewed a sculptor that has been working on the decorations for over 40 years. When he started he was a Buddhist but decided he had to convert to Catholicism to give meaning to his work.. 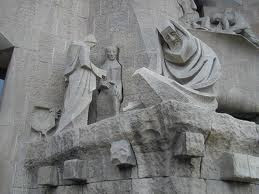 Architect is/ was a man called Antoni Gaudi - who appears to have been ahead of his time, driven and nutty in equal measures. 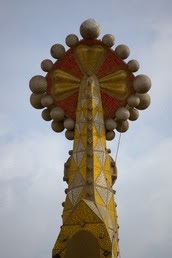 Gaudi was run over by a tram in 1926 but his inspiration has continued. much of what had been built was bombed in the Spanish Civil war in the 1930s but has been painstakingly rebuilt. There is a NZ architect who is now over sighting the project. It was really fascinating. If you ever happen to be in Barcelona it would seem to be well worth visiting. It really was a most interesting piece that reminded me very much of the European cathedrals we have seen. The Dom in Cologne took 500 years to finish - several generations of stonemasons who never saw he completed work. The master architects and sculptors that were interviewed last night were hopeful but not totally certain that this basilica might be finished in their lifetime. That they might just see the completed work. It is funded through donations so sometimes work slows as they look for funds . . .